The Dark Souls creators have devised some of their most fiendish boss fights yet. It wouldn’t be a From Software game without incredible boss fights. 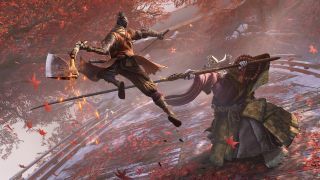 In Sekiro there’s a wide range of powerful warriors and creatures that will force you to use all of your shinobi arts. The simplest fight, between your shinobi and a master samurai, can be as tense and challenging as a battle with a huge ape-like beast. Sekiro’s bosses are also capable of deception and trickery. Spirits can fade and reposition in a puff of colourful vapour, and Lady Butterfly can vault between near-invisible threads of silk at bewildering speed. They are tough, too. You can still chain together blows to damage their posture and open up Deathblow opportunities, but while ordinary soldiers can only take one Deathblow, bosses can take several. You need to demonstrate a sustained mastery of your enemy’s attack patterns to break their posture down and unlock each Deathblow opportunity. This is especially difficult because bosses have access to unblockable attacks. Look out for a red symbol above their head as they launch an attack; that means you have to get out of the way quickly. Some enemies can also lunge forward and grab you. If this happens you will be subjected to a massively damaging attack that can kill you outright, or throw you off a nearby cliff. You will need skill to defeat them, but you can gain an advantage by carefully managing your resurrection ability. You will likely be able to resurrect only once in a fight, and it’s important to use that power wisely. If you haven’t even secured one Deathblow yet, it might be wiser to retreat and come back again with full health and a resurrection in your pocket.